Find your Nearest Dealership To find your nearest dealership, simply enter your postcode or location below. Sytner Group are very proud to represent new Rolls-Royce at state-of-the-art dealerships nationwide. To find your nearest Rolls-Royce dealership, simply enter your postcode or location below. At Sytner Group, our customers are our number one priority. If you would like to discuss your experience at one of our Rolls-Royce dealerships, please feel free to contact us directly using the links below. At Sytner Group we are passionate about customer service, so much so that we survey each of our customers to determine satisfaction levels. During the last three months the team at Rolls-Royce have scored a 100% positive response. Rolls-Royce Maintenance Sytner Rolls-Royce offer our valued customers a full complement Rolls-Royce Aftersales options, including Rolls-Royce Service, MOT and Repair. A selection of the latest promotions from our Rolls-Royce dealerships. Sytner Rolls-Royce Finance and Insurance When you are looking to purchase your Rolls-Royce from the Sytner group, we are able to offer you a wide range of choices when it comes to funding and we have access to a number of different finance choices which means that we can find the best finance package to suit you. Why Choose Sytner Rolls-Royce At Sytner Rolls-Royce we are dedicated to providing the highest level of service to all customers. So whether you require our sales or aftersales service, we would be delighted to assist. At Sytner Rolls-Royce we are incredibly proud of our association with Rolls-Royce Motor cars and as a result we provide a standard of customer service which is commensurate with the world-renowned brand. Sytner Rolls-Royce currently operate dealership locations in Wilmslow and Sunningdale, providing the full range of products and services to our valued customers. Each of our Rolls-Royce Authorised retailers offer all New Rolls-Royce vehicles, a wide selection of Approved Used Rolls-Royce Motor Cars and the complete range of Rolls-Royce Aftersales services. If you find that you are unable to find the information you were looking for, we invite you to contact your nearest Sytner Rolls-Royce dealership, where a member of our dedicated, knowledgeable and experienced team will be more than happy to discuss your individual requirements. Thank you for visiting Sytner Rolls-Royce, we appreciate your custom and look forward to seeing you very soon. After 18 months of renovation and development, Rolls-Royce Manchester have now relocated and fully settled into the brand new dealership, now located in Wilmslow. The new facility is the epitome of state-of-the-art. 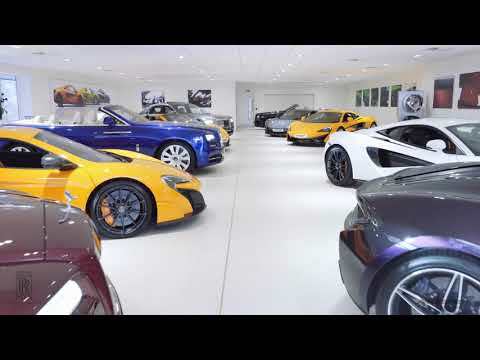 Combined with Styner's McLaren, the luxury dealership features a range of new Rolls-Royce models, as well as various pre-owned luxury vehicles, over two floors.